Otterbein and Shaw Retreat Centers Otterbein and Shaw Retreat Centers each accommodate a minimum of 20 guests and a maximum of 50 guests. Guest groups staying in Shaw and Otterbein Retreat Center enjoy their meals in Asbury Dining Hall. These modern multi-purpose retreat centers were built in the early 1990’s. Shaw and Otterbein Retreat Centers both have two sleeping wings with five separate sleeping rooms and modern restroom and shower facilities in each wing. Four sleeping rooms in each wing are equipped with three bunk beds (6 person capacity in each room). The fifth room in each wing has two twin beds and may serve as a retreat leader’s room. Shaw and Otterbein each have a large carpeted meeting room with a fireplace, a snack kitchen with refrigerator and microwave, and lots of outdoor deck space. A TV with DVD/VCR player is located at both retreat centers. Otterbein Retreat Center is equipped with a piano. An outdoor campfire ring, an open-air chapel, and an activity field are near each retreat center. Otterbein Retreat Center is closest to Asbury Dining Hall. 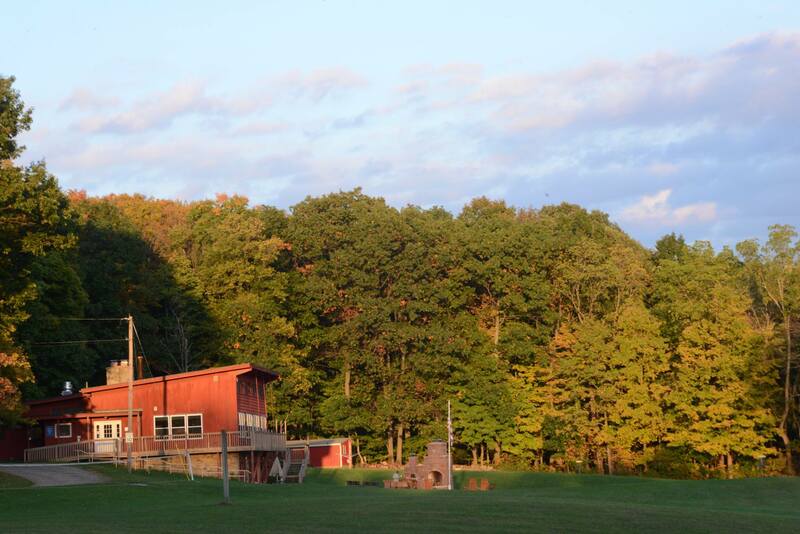 Shaw Retreat Center is situated in a secluded area directly west of the camp’s main entrance. Epworth Retreat Center Epworth Retreat Center accommodates a minimum of 15 persons and a maximum of 32 persons. Epworth retreat center allows guest groups the option of preparing their own meals in the Epworth kitchen or utilizing Camp Asbury’s year-round food service at Asbury Dining Hall. Epworth Retreat Center features a common dormitory wing for each gender. Each wing can sleep up to fourteen persons (in seven bunk beds). Two small leader rooms with one bunk each are located between the two dormitory wings. A 20′ x 30′ meeting room with a fireplace, an equipped kitchen, and modern restroom facilities complete the building. The kitchen is equipped with a commercial gas stove and oven, microwave, refrigerator, freezer , cookware, dinnerware , and table service. Breakout meeting space for several small groups can be accommodated in Epwort h retreat center. A TV with DVD/VCR player and a piano is located in the retreat center. Epworth guest groups have exclusive access to an outdoor campfire ring, a lighted outdoor picnic pavilion, and an open-air chapel adjacent to the retreat center. Cabins For those wanting a more rustic camping experience, Camp Asbury has 11 unheated cabins that can be used from May-October, when available. Cabins are furnished with bunk beds and house a maximum of 12 persons. Restroom facilities for those staying in cabins are located in the Otterbein Retreat Center. Asbury Lodge (Dining Hall): Guests receiving food service eat their meals at Asbury Lodge, the camp-dining hall. A picturesque view of the valley and lake provides a pleasant atmosphere where groups share meals with others at the camp. Retreat group volunteers assist Asbury kitchen staff to set tables, deliver food to the tables , and help clear the tables after meals. Guests consistently praise Asbury meals as the best quality food they have enjoyed at a camp. Asbury food service offers appetizing meals served “family -style” in Asbury dining hall. Asbury food service is able to accommodate most special dietary requests and food allergies. The lower level offers a large group meeting space (30′ x 50′). The meeting room has an outside entrance and is able to accommodate approximately 130 people. This may be reserved on a first-come­ first served basis for a nominal charge. Outdoor Chapels Four outdoor chapels are located around camp. These places provide beautiful, natural settings for groups to hold outdoor meetings, gatherings, or worship. Campfires add a glow to your event Asbury’s main campfire ring with permanent seating for 100 people is located 100 yds. east of Asbury Lodge. A campfire ring is also located at Lake Hibbard. Smaller campfire rings are located adjacent to Shaw Retreat Center and Epworth Retreat Center. The Asbury staff will be happy to set up a campfire for your group at no charge. All retreat facilities and Asbury Lodge have working indoor fireplaces. Firewood is provided by Camp Asbury. Please do not transport any firewood to Camp Asbury, due to the threat of the Emerald Ash Borer and other diseases .